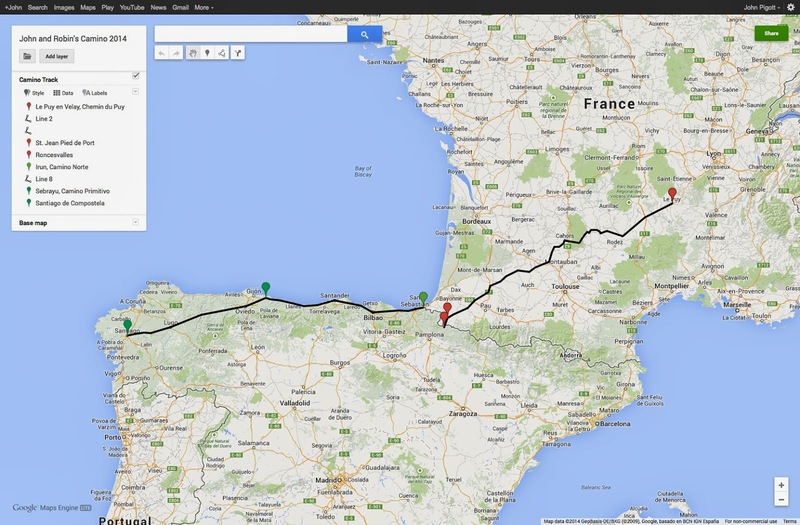 I put together a rough map of how Robin and I will be walking to Santiago. Starting in Le Puy we will walk to St. Jean Pied de Port, and then on to Roncesvalles via the Route Napoleon. We had to walk the Valcarlos route to Roncesvalles (due to winter weather concerns) on our two previous caminos, so this year we will try for the (more?) scenic route. Although, I must admit we have always enjoyed walking up the valley. Once we get to Roncesvalles then it will most likely be a return to St. Jean (bus or taxi), and then surface transportation to Irun, where we will start the Camino Norte. Our plan is to follow the Camino Norte until Sebrayu, and then veer off onto the Camino Primitivo. The Primitivo will take us to Melide on the Camino Frances, and then its just a couple of days on into Santiago. This camino is approximately 1600 kms, or 1,000 miles. We have time on our side (90 days Schengen visa requirements) and will not be setting any land speed records for this route. Our intention is to savor every step of the way (and there will plenty of them). We will be looking for good spots to lay over as our bodies or spirits require, and plan on taking occasional diversions as well. At this point side trips (in France) to Rocamadour and down through the Célé Valley are already scheduled. I am sure others will emerge once we get underway. This will be a fantastic camino. God willing we will see it through. Regardless of how it works out we plan on having a lot of fun simply trying. Glad to see you are doing the Norte! Hi Heather, we will get to do a bit more than half of it, and save the rest for another day. Hi Karen. Thanks for checking in. Robin and I are now in the fine tuning stage as we assemble our gear for the trip. Trying to balance the expected cold and hot weather, and still keep our pack weight down is the challenge “du jour.” But, it will work out. Say Hi to Dayton. Glad to have you both along for the journey. Now, let's see what plays out.